The play "Keisei Hangonkô" is divided into 3 acts. The "Domo Mata" scene is the first scene of the third act. The play "Keisei Hangonkô" was written by Chikamatsu Monzaemon for the puppets theater and performed for the first time in the 8th lunar month of 1708 at the Takemotoza (Ôsaka). It was adapted for Kabuki for the first time in the 1st lunar month of 1719 by the sakusha Kyôya Yagoshirô and was staged in Ôsaka at the Kado no Shibai with the following casting: Arashi San'emon III (Matahei), Nakata Rokujûrô (Otoku), Takenaka Tôzaburô (Shôgen), Sakurayama Kindayû (Shûrinosuke) and Yamamoto Hikogorô (Utanosuke). 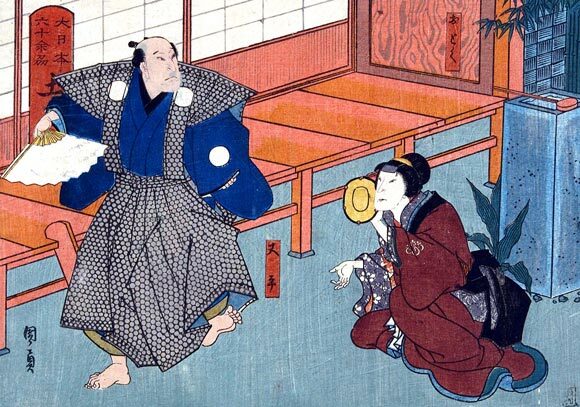 The "Domo Mata" act was performed independantly of the rest of the play for the first time in Edo in the 10th lunar month of 1801 with the following casting: Ichikawa Danzô IV (Matahei), Osagawa Tsuneyo II (Otoku), Ichikawa Tomozô II (Shôgen), Osagawa Shichizô II (Shûrinosuke) and Ichikawa Aragorô I (Utanosuke). Matahei, who is a disciple of ex-court artist Tosa Shôgen Mitsunobu, has been making repeated calls on his master in order to get permission to use the respected Tosa name. Today, also, he has come to his master's house with his wife Otoku. By chance Mitsunobu, Matahei, and his wife meet a group of peasants searching for something. Listening to their story, they realize that the peasants are in pursuit of a tiger. Mitsunobu, however, laughs and refuses to believe them, saying there are no tigers in Japan. Then he sees the tiger and realizes that it must be a creature from a different dimension. To his artistically trained and critical eyes, the tiger's characteristics mark it as the work of a Tosa school artist. So, Mitsunobu calls one of his most promising young disciples, Shûrinosuke, and orders him to bring a brush and ink. He tells him to draw the tiger and make it take on life. Doing this will allow the tiger to escape from this world back into the artistic world from which it came. Shûrinosuke does as directed. As Mitsunobu expected, the tiger in the grove disappears. Mitsunobu rewards Shûrinosuke for this achievement by allowing him to use the name Tosa. Matahei is, of course, completely humiliated; nothing is more disgraceful than being regarded as inferior to a younger disciple. Following this, Utanosuke, an agitated young artist, arrives with some news. He reports that another of the disciples of the Tosa school and his sweetheart are in danger on a false charge. They are in need of urgent aid. The bearer of this news volunteers to help them, asks Mitsunobu to send more men, and then dashes off. Mitsunobu calls on Shûrinosuke to lead a group of men to go to their rescue. Matahei implores Shûrinosuke to allow him to join in the rescue, but in vain. Matahei once again has to endure the humiliation of seeing the younger disciple favored ahead of him.